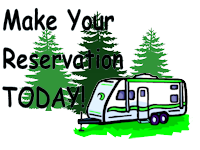 Come spend time with a camping friend or family member. Come spend the day at the camp to fish(catch & release), swim at the beach, play on the playground. $15 per person per day for an Activity Day Pass to use the Zip lines, Water slide, Climbing wall.